TimeNTracker suite is an integrated suite for time record, time tracking and time billing software. The TimeNTracker suite of products delivers a time tracking solution for professional service providers. Each of our products has been designed to meet the time tracking needs of specific segments of the service provider market, including both time tracking and time and billing applications. Track My Time feature of TimeNTracker time tracking software facilitates managers in the monitoring operations to effectively monitor the achievements of their workforce while they work around the clock. The Track My Time feature also helps the supervisors to determine the productivity pattern of the workforce during different times of day and can identify opportunities to motivate workforce to achieve desired performance. The time tracking software comes in really handy in monitoring the employees’ productivity hours and keeps a good check on their performance. E-mail notifications can be customized to remind employees about their pending timesheet and also reminds the manager for the pending approvals. There are other useful notifications as well in Track My Time feature of TimeNTracker time tracking software that can be used to notify employees about the changes in system. Detailed and summarized online timesheet reports are available with all possible filters. You can create reports and also customize previous ones. Track My Time supports customized periods for your time sheet input in accordance to your preferences. You can define approval paths in time tracking software accordance to the hierarchy that is followed inside your organization. This provides a structured solution so that respective managers can approve of the project in a sequential manner instead of manually sending requests for approvals to each and every manager in accordance with the hierarchy. Audit of Track My Time keeps track of every input/modification of each timesheet. The TimeNTracker time tracking software is accessible from all around the world through a simple browser. TimeNTracker Expense Tracking software feature gives instant expense management solutions against current and future projects that are to be run in the organization. The completion of a specific project is not the achievement; the achievement is efficiency in achieving it that is utilizing the minimal resources in achieving the desired goal. The expense tracking feature does not cut your expenses, it helps you to take control of them so that you can manage your overhead expenses by cutting down unwanted process or implementing a solution which will save you money in the long-term. Provides an expense tracking sheet to input expenses against the projects, this allocates the expenses to their respective projects. It also allows you to enter the mileage for your expenses. The feature also supports customization approval paths which can consist of multiple levels of approvals for certain projects and employees. The customized approval path gains you the advantage of structured proceeding towards the execution of certain projects. Enter expenses in multiple currencies with according to conversion rate history (Date has to be set by you). It saves you the hassle of converting the currency yourself and then entering the expense incurred. You can also customize the calculation according to your regional policies of taxation. Multiple taxes can also be applied on a single item. Billable/Unbillable option to define whether or not the client should be billed for an expense incurred. Track your expenses for pending reimbursement and mark those who are reimbursed already. Expense receipts and memos can also be attached for the authority to review it and approve it afterwards. Reminder and notifications will be sent on the scheduled basis to the authorities for their pending approvals regarding certain projects. Detailed and summarized expenses reports are available with all possible filters. You can create reports and also customize previous ones. TimeNTracker’s time off tracking feature is much more than just a utility to the organization, it allows managers and supervisors to create a perfect time tracking system within their subordinates. The manager can schedule the time-off for employees in advance and manage accruals accordingly. As you may already know MapleLeaf Technologies has a lot of concern for your organizational values and because of that TimeNTracker is designed to be flexible, meaning it can adopt to your organizational policies. Time-off policies for individual employee or a group of employees can be setup through TimeNTracker as well. Customize time-off policies in order to allocate accruals/ earnings based on each month, year and anniversary date etc. You can either reset the balances to new or carry them forward from the previous to current period. You can define custom approval paths according to your organization’s hierarchical structure and request for approval for a time-off through that specified approval path. It saves you the hassle of individually attaining approvals from multiple authorities. It will remind the manager in regard to their pending approvals. Detailed and summarized timesheet reports are available with all possible filters. You can create reports and also customize previous ones. You can directly generate invoices for your customers through TimeNTracker’s Time billing feature of Time Tracking Software. The time billing feature accumulates time and expense data that has been applied towards a certain project to bill its customers. Note: Once a single time data entry or expense data has been billed it will not be fetched again. You can put in custom billing rates to calculate invoice amount for customers. Analytics and reports portraying time/expense already billed and time/expense that is still pending and needs to be billed. Displays defined logos and footers on the invoices. You can make detailed and summarized custom online timesheet reports and also customize the older ones. The data can be input in multiple currencies for your ease and convenience, the billing will be done in the currency chosen by you and the rates of the currency can be associated by simply entering a dated criterion. Assigns a certain status that that indicates if a client has already been billed or is to be billed for services in the future. TimeNTracker is an electronic timesheet software which serves as a complete web based project management tool that not only assists you in project management but also lets you manage finances for your projects and requires no extensive training programs to implement. It leverages both departments to be effective and efficient as it cuts down a lot of unnecessary procedures required to manage accuracy of tasks in individual departments. Making a budget is very important prior to the start of a project; it has to be done very carefully considering all the data and uncertain factors so that the hurdles in the project are minimized at the start. An organization must have strategic plan to achieve their goals but tactical planning is just as important, the best method is to set several small short term goals leading to long term goals ultimately. This strategy helps the managers in keeping their teams motivated towards goals. When an online time sheet is approved by a manager the its status is updated automatically. Budgetary control and project budgets facilitate managers in limiting excessive spending and set boundaries for the project, allowing managers to test their management skills and abilities to manage the operations efficiently. Keep your team mates and managers updated with automated e-mailing. This minimizes the communication gaps not only inside the departments but also between different departments; it allows each and every team mate to be at the same place. Identify high risk projects at early stages to effectively manage the risks associated with the projects. Minimizing the risk is a crucial factor for any project therefore the decision maker must evaluate alternatives and come up with that one alternative that provides a balance between returns and risk. Expense tracking spending on each project. This helps you set boundaries for projects so that excessive spending on a single project could be avoided. Resources have to be spent efficiently to develop a healthy habit. Compare allocated time and budget with actual time and spending. Determine how successful you were in the controlling process by comparing the actual and estimated costs to know exactly how efficient your team was in achieving the required goals. Use the cross-project Quickbooks timesheet to measure the productivity and efficiency of your team. Compare project’s efficiency by comparing different projects statistics. Use the Gantt chart to allocate resources on the project accordingly and measure the performance through graphical charts. TimeNTracker gives a complete web based online timesheet software that not only assists you in project management but also lets you manage finances for your projects and requires no extensive training programs to implement. It leverages both departments in effectiveness and efficiency as it cuts down a lot of unnecessary procedures required to manage accuracy of tasks in individual departments. Add a note to a project in progress regarding some changes or to an employee’s Quickbooks timesheet with one click. This option allows you to provide special guidelines to the employee regarding the project and can be very helpful in complex projects. You can download your project’s time sheet to track progress of a single or multiple projects. Tracking progress allows managers to effectively plan further operations to be carried out in future. This also allows the supervisor to re-consolidate the performance of employees by comparing the projects’ progress with the time. Reject – will revert the current status of time sheet to “not submitted”. Keep Expense Tracking of each project. This helps you set boundaries for projects so that excessive spending on a single project could be avoided. Resources have to be spent efficiently to develop a healthy habit. Use the cross-project online timesheet to measure the productivity and efficiency of your team. Compare project’s efficiency by comparing different projects statistics. Use the Gantt chart to allocate resources on the project accordingly and measure the performance through graphical charts. This again helps the manger to monitor the resource utilization process and identify the loopholes and what processes can be used to minimize them. 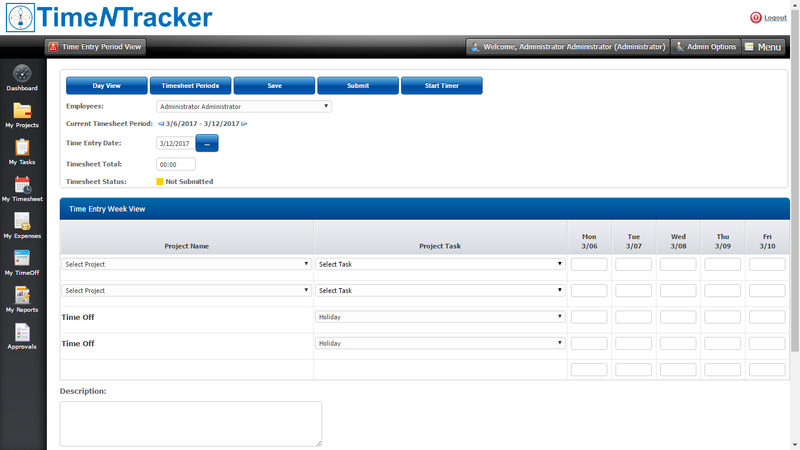 TimeNTracker QuickBoooks Integration Manager provides users the ability to transfer information between TimeNTracker and QuickBooks Timesheet. With the ability to transfer time and expense data, the integration module is an ideal solution for those working on projects or tasks that are to be billed to clients. Using TimeNTracker, you can track the actual time spent working on projects, then transfer the data to QuickBooks Timesheet, to invoice clients for the work completed. This point highlights the transferability of data between TimeNTracker and QuickBooks Timesheet. The data can be transferred from TimeNTracker to QuickBooks and from QuickBooks to TimeNTracker as well. You can utilize our web timesheet integration manager to save you the time and effort of entering the data over and over again and also the process is accurate when you make use of our web timesheet integration manager. Another amazing benefit that TimeNTracker gives you is that you can also transfer your employee time data to QuickBooks Timesheet for payroll purposes and generate payroll. QuickBooks Timesheet Integration manager provides step by step instructions for the purpose of transferring data through a wizard, In-depth information is also provided to facilitate the users to configure already available options. The wizard also requires users to provide supporting information for the transfer to be facilitated. Track the actual time spent working on certain projects in order to accurately bill clients for the work done. You can provide time and expense data as an evidence of the backend and efforts put into a certain project. This demo has been designed to simulate the real time experience for this product. It includes sample data of a demo company, and user will have the ability to control features and functions, just as an actual TimeNTracker user (with some security limitations). Periodically, we will refresh the data to help everyone share similar experience when entering the Demo. Note: please refrain from entering any personal or offensive data, as other evaluators may see this information before the session refreshes. The “Administrator” account will provide full access to administrative features available in the product. Here, you will see features that will assist Administrators in managing TimeNTracker and their Users.